As the mama of three spunky girls who play the violin, recite sound of music, and hunt for bugs and worms at their local park, Beth has experience both searching for lost hair clips that have fallen out and meeting the budding fashion desires of one precocious toddler after another. This makes her an expert in my book. 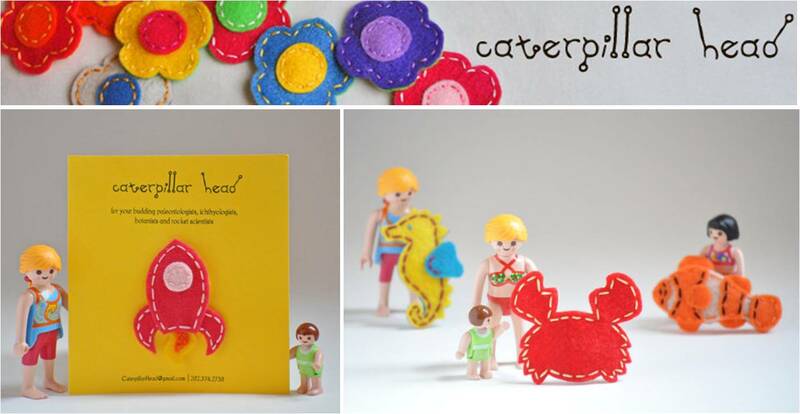 She began creating hair clips for her girls to fill the market place void - her hair clips are both adorable and sturdy. Beth is giving one lucky Scribble Pad reader two hair clips of their choice! Visit Caterpillar Head and leave a comment stating which hair clip you would purchase, and who in your life would get to wear it. p.s. totally fine if that someone is you. a certain blogger I know can often be found wearing her daughter's hair clips. Christie Grennes is the winner. The cutest! Hands down, the sparkle fish and the cupcake (aka "Happy Cakes!" according to D). They would be worn by Miss D herself, and maybe her baby dolls. I would get the cupcake for Fern and the pink elephant for Amelia. *I've also liked them on Facebook, and I'll tweet about it, too! I'm pretty sure I would pick out the sparkle fish. IT is so cute. I also love how she does her pictures with the little people. So cute and creative. i would have to get the sparkle fish felt clip because Lily loves everything water and sparkle. thanks for letting me know about the giveaway!! Oh, I love that sparkle fish and the cupcake! Avery would love them- sparkly, sparkly, sparkly! And I favorited them on Etsy! I tweeted about this! Wahoo! I like the scotty dog and the flowers!